What is a peer-to-peer loan? A peer-to-peer loan is a unique form of credit. Instead of going to a bank for a traditional loan, you borrow from real people. But unlike the type of personal loan you’re used to – one from a family member or friend – with a peer-to-peer loan, you borrow money from perfect strangers. Peer-to-peer (P2P) lending typically takes place on an online platform – sort of a loan matchmaking service – that connects borrowers with investors who supply the funds. The online company coordinates the loan, transfers the money to the borrower, and repays the investors as you pay off your loan. Why would others loan money to people they don’t know? Investors participate as a way to earn money from your interest payments, diversify their portfolios, and even just to make a difference in the lives of people and small businesses. 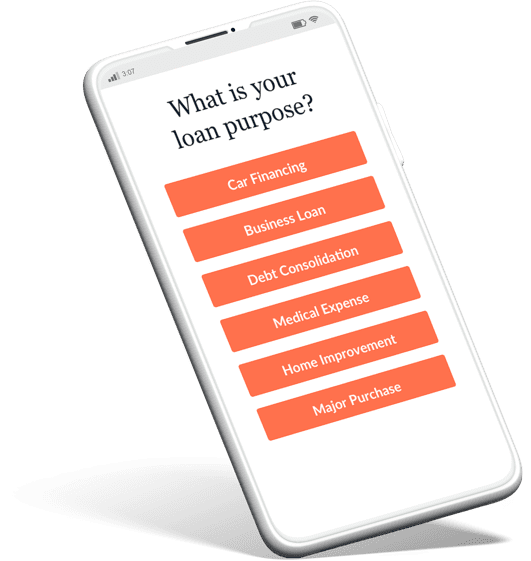 When you apply for a P2P loan, potential investors – regular people who are looking to grow their money with your interest payments – review your request, choose whether to finance the loan, and commit to funding all or just a part of it. (For this reason, there may be multiple people who are actually providing the capital you need.) Then, as you pay off your P2P loan, those investors receive regular payments until the loan term ends. How much you can you borrow? When you take out a personal peer-to-peer loan, you can generally request a loan between $1,000 and $40,000, although that varies by lender. Like most loans, a P2P loan typically requires you to repay the principal with interest in fixed monthly installments. That monthly payment amount depends on the size of your loan, the loan’s term, and your APR, which likely includes an origination fee. An origination fee is typically a small percentage of the amount you want to borrow. Keep in mind when you apply that the origination fee is deducted from the total amount of the loan before you receive it. The origination fees for LendingClub, for instance, range from 1% to 6%. So, if you’re approved for a $10,000 loan with a 5% origination fee (or $500), you’ll receive $9500 as a deposit in your account. Keep that in mind when you borrow, so you make sure you actually receive enough money for your goal. Fill out some personal information online, and describe how you intend to use the loan. The form generally takes only a few minutes to fill out. You must complete the application form and submit qualifying documents, including proof of income. You need to provide your employer information and show pay stubs, W-2s, tax return forms, or even bank statements. If you qualify for a loan, you have the opportunity to look over the different terms of available peer-to-peer loans and select the one that best suits your needs. At this stage, you receive notification that one or more investors are interested in funding your loan, or you find out that your loan hasn’t been funded. Don’t worry; investors make decisions quickly. In fact, the entire loan approval process typically takes about a week, unless the lender has to request additional documentation from you. If investors commit to funding your loan, provide the lending company with additional details regarding your finances, as well as specified documentation to verify your identity, income, and employment. If all the information you supplied checks out, the loan you requested is most likely approved at this point. Within a few days, the amount you’re borrowing – less the origination fee – is deposited in your bank account. The exact timing depends on your lending. Lending Club, for example, says the entire process typically takes seven days but “in some cases it can take a little longer” if they need to ask the borrower for additional information or documents. Once your loan term begins, your lending company will automatically withdraw your monthly repayment amount from your bank account until the term of your loan ends. There’s no need to drive to one or more banks and spend time in uncomfortable, face-to-face meetings. Instead, you submit your application online, provide supporting documentation, review your options, choose your loan, and receive your cash all from the comfort of your home. If the bank denied you because you present with certain risk factors, such as a low credit score or low income, your P2P loan options may be limited to those with high interest rates. LendingClub’s top rate is a whopping 35.89% fixed APR, and Prosper tops out slightly higher at 35.99% fixed APR. 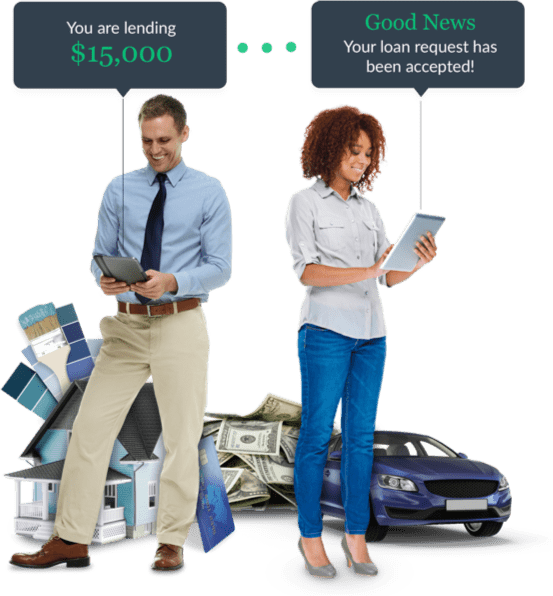 Still – if you really do need that cash – having that peer-to-peer loan as an option might be better than having no credit at all, or going with a riskier loan option like a payday loan or title loan. LendingClub’s personal loans start at 5.99% fixed APR. Prosper’s rates also run as low as 5.99% fixed APR. And Funding Circle’s small business loans start at just 4.99% fixed APR. These can be much lower than alternative borrowing methods like a credit card, but, of course, you’ll need the best credit to get the lowest rates. Sam Hodges, co-founder and managing director at Funding Circle, shares that his business connects investors – individuals, financial institutions, and even governments – exclusively with small businesses. Since its inception in 2010, Funding Circle has facilitated $5 billion of loans to more than 40,000 businesses around the world. What happens if your loan isn't approved or funded? With most P2P lenders, you’re likely to have your loan application denied if your FICO score is below 640. If you just squeak by the cut-off, you may have a few options, but they’ll probably come with a high interest rate. Peerform, a prominent peer-to-peer lending company, tells you upfront that no credit usually means no P2P loan for you. Investors need to determine how likely you are to repay a loan. So, when you don’t have a documented history of financial responsibility, investors won’t want to take a chance on you. If the amount of debt you have is very high when compared with your income, investors get scared. They worry that you’re already in over your head, so they steer clear of extending you any more credit. Been at your job for only a few months? You’ll probably get turned down for a P2P loan. But, if everything else looks good on your application, your chances for loan approval increase once you’ve been employed for a full year. Applying for a business loan? Hodges says Funding Circle does not work with businesses younger than two years old. “We are focused on serving established businesses that have assets and cash flow to secure loans and a legitimate plan for growth,” he said. Keep in mind that the decision to fund your loan is up to the individual investors. When someone defaults on a loan, the lender doesn’t get back his money and walks away with nothing. So he or she will be looking to invest as safely as possible – not in someone who seems like a big financial risk. What to do if you are denied or your loan isn't funded? Many credit cards publish your current score directly on your monthly billing statement. (Ask your card company if you can’t find it on your paper statement or online.) You can also get a copy of your score online. Rebuilding your credit takes time, but you can make great progress by committing to paying all your bills on time, keeping your debt low, and keeping old cards open. Apply somewhere else. Each peer-to-peer lender is different when it comes to application approval criteria, loan options offered, and investors available. So if you luck out one site, check out one or more other P2P lending sites. Be sure to review our tips below for choosing a reputable lender. You already know that shopping around for a loan may be necessary if one lender flat out turns you down. But you should seriously consider checking out a number of options even if you are approved. When you compare your options across two or more P2P lending sites, you’ll find different loan options and a variety of investor pools. Remember: Your interest rate is dependent upon a number of factors, including your credit score and loan term. And every lending company has its own way of determining how risky you are, so one might view you more favorably than another. Make sure you’re working with a company that’s been in a business for at least a few years and offers you access to a large pool of investors. With more than $31 billion borrowed and 1.5 million customers, LendingClub is currently the largest peer-to-peer lending site. Other major players include Prosper, Peerform, Upstart, and Funding Circle. Do your research. Check with the Better Business Bureau, and read customer reviews to make sure that the companies you’re considering are above board. Make sure that the P2P lender operates in your area. Many lenders are limited to certain countries and don’t do business in a handful of states. Find and apply for a personal loan by checking out what your local bank or credit unions are offering; then, follow up by comparing offers from multiple lenders online. If you’re looking to grow your business and need the capital to do it, you may want to look into special business-only loans available from banks or investors. If you have equity in your home, you may be able to transform it into cash that you borrow against. Credit cards are a form of unsecured debt – so no one can take your house or your car if you default – but nonpayment can tank your score. Before you use your cards, check your available line of credit and your monthly interest rate. No matter what type of loan you choose, always make sure that understand all of your financial responsibilities before you sign on the dotted line. A peer-to-peer loan is a special type of credit that comes with its own requirements, terms, and conditions. In today’s lending climate, P2P lending may be an excellent way for you to supplement your personal life or your growing business. Types of Personal Loans: Which Option Works For You?